The Nintendo Switch and Playstation 4 versions of Light of Hope feature a multi-player system that allows someone sitting next to you (not remotely over the internet) to control a gem sprite that works along side you with your farm chores. 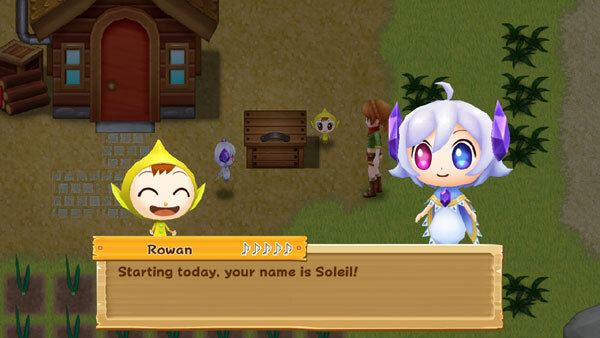 Soleil the gem sprite is NOT controlled by the game AI as a farm helper. After you obtain a hammer and repair the entrance to the mine, you'll find a Magentocrystal on the first floor. The gem will be placed inside of your farm house. 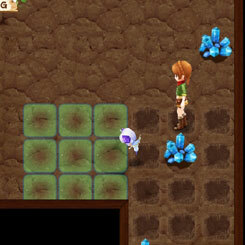 To hatch the gem sprite hidden within the gem egg, interact with the gem once per day. After about 7 days the gem sprite, Soleil, will appear out of the gem. At first the gem sprite just floats around and looks cute. Give it gifts to raise its friendship and at about 1 music note you'll see an event where Soleil starts to fully awaken. From this point you'll find Soleil inside your farm house, outside in your fields, and even wandering around other areas. Only you and the Harvest Sprites can see Soleil. Once Soleil is awake and available, you can activate their multi-player options by pressing the action button on the Magentocrystal inside of your farm house. By default Soleil will have 2 hearts of stamina, but you can pay for more stamina by offering a processed gem. You can get gems from the mountain ore mine and then have the raw ore processed at Gus' Blacksmith Shop. The quality of offered gem will affect Soleil's stamina hearts: a basic Agate will give Soleil 3 hearts of stamina, while a Soul Gem will give Soleil 10 hearts of stamina. You can also activate Soleil without paying any gems, but the person controlling Soleil will only have 2 hearts of stamina. Once Soleil's stamina is exhausted, the sprite will disappear and return to the Magentocrystal inside your farm house. Soleil can be activated again the next in-game day. The gem sprite can only be controlled by a real-life person using a second controller. For the Playstation 4 version of the game your friend will need to be signed into their Playstation account. For the Nintendo Switch version you just have to activate Soleil and follow the on-screen prompts to use the detached joycon controllers. Even single-player farmers can utilize Soleil to help make the game a bit easier, especially when trying to explore the ore mine. Simply use the second controller to search the mine floors for the hidden staircase using Soleil's stamina (and faster hoe ability) instead of your main character's stamina. Basically you're increasing your default 5-hearts of stamina. When Soleil's stamina is used up and they return to the farm house, you can then take over as the main character to continue exploring the mine. The screen area that the two of you can work on is controlled by the farmer character. Soleil cannot move beyond the on-screen area and will teleport back to the farmer's location if the one controlling Soleil attempts to move off screen. While the farmer player still has to wait for an upgraded hoe and watering can to charge before releasing the action button, Soleil's tool charge-up is much faster. Soleil can be used to take care of crops, care for animals, harvest lumber and pull weeds, break ore nodes in the mine, and even go fishing! Just remember Soleil cannot work independently in a different area that the farmer player (e.g., you can't go to the farm to water crops and have the Soleil player catching fish at the mountain pond). Any harvestable item that Soleil collects will be transferred to the farmer player's bag. Soleil cannot be used during the fishing festival. If you activate Soleil before the tournament, they will disappear after Sam's introduction. If you try to activate Soleil during the fishing tournament, the Magentocrystal will respond with a notice that you can't ask Soleil for help at the moment. Well drat! Raising your friendship with Soleil can trigger their romance events. Going through these events will transform Soleil into a normal, human form. Soleil's first music note event is when they wake up, Rowan gives them a name, and then Soleil get stuck in the shipping bin. Walk into your farm house at night (after 7pm) to invite Soliel to go to the beach together. Listening to the waves brings music into Soleil's head. Soleil thanks you for giving them food and a bed, but when you aren't around Soleil feels weird. Soleil will transform into a human for a brief moment, but then return to their gem sprite form.